After successfully having run an experiment, the next important step is analyzing the data. 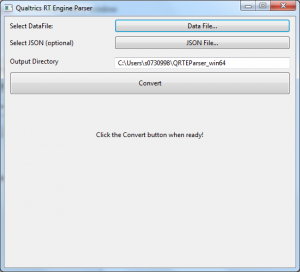 Although Qualtrics provides a simple way to download the data file, but this data file can’t be used yet by statistical packages such as SPSS and Excel. A file conversion step is needed and in this tutorial we hope to explain how to do exactly that. There are two reasons why the extra parsing step is required. First of all, Qualtrics generates a file in a wide-format, meaning that every subject has its own row in the data file. This is generally not how SPSS and Excel expect data files to be formatted, the expected format is a long-form (with every trial having its own row). The parser will make this conversion. The second reason is a bit more insidious, and sadly can’t be worked around. The gist is that Qualtrics only accepts a set amount of answers, rather than allowing for more answers to be added dynamically, depending on the needs of the current trial while the trial is ran. So, rather than dynamically creating extra answer options, we build an object containing all the answers and then put this into one answer field. The QRTEParser then takes this answer field and creates as many columns as are necessary out of the answer options contained in the field. We won’t go into the details of this process, but rather give you a step-by-step guide on how to go from a Qualtrics data file, to running the parser on it and getting a converted data file. Go to the ‘View Results’ tab, click on ‘Download Data’ and then select ‘Download as CSV’, which will start the process of creating a Comma Separated Value (CSV) file out of your data. Depending on the amount of respondents, this could take a while. We find it handy to uncheck the ‘Compress file into ZIP’ option for small downloads, where it simply adds another step in converting the data, and doesn’t save much in the sense of storage space. Important: There is a ‘Download Data’ button under the ‘Reporting’ tab that allows you to download a CSV file as well. However, the file downloaded through this window does NOT work with the parser. Please take care to download the data through the View Results tab! 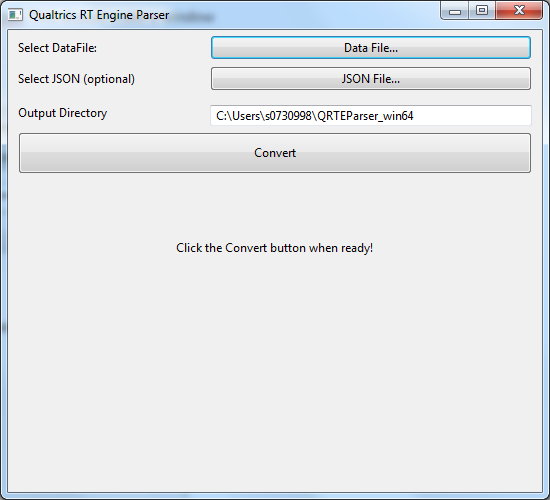 The parser can be found here: http://www.qrtengine.com/getting-started/download-qrteparser/. Please download the file that is suitable to your Operating System. Click ‘Open’ and then hit the big convert button. 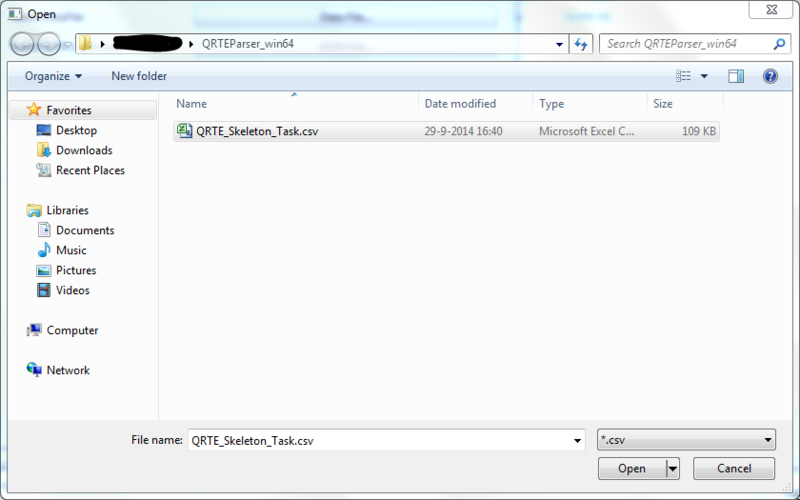 This will, in our case, result in a file named QRTE_Skeleton_Task_out.csv, which is placed into the same directory as the the original file came from, unless you change the output directory in the main window. Press ‘Ok’ to locate the .csv file that you want to parse. After locating, press ‘Choose’. That’s all, the parsed file will now be saved in the same folder as the original file with ‘_out’ appended to the filename. We don’t have an GUI for the Parser yet, a tutorial on how to use the Command Line Interface will be made soon. Please note that in all version of the parser the order in which the trial are output is based on the order of rows in the L&M spreadsheet. Generally, you’ll randomize over these rows, so if you look at it from the order in which the actual trials were ran, the output data file might seem random. To fix this, sort the file on Init[Onset] on a per subject basis. Qualtrics, as a US based company, uses dots ( . ) to denote decimals. However, in some countries (like The Netherlands), the standard is to use commas ( , ). This causes issues when spreadsheet editors such statistical packages such as Excel and SPSS expect commas, rather than dots. If you experience strange things in your output file,we recommend checking the localisation settings first and changing them to English (US). If you have any questions or comments on this guide, please drop a line at support@qrtengine.com. Thanks for reading!